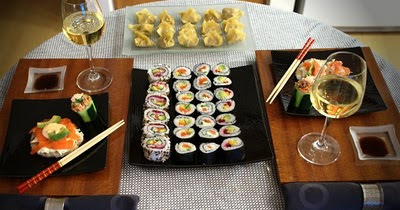 We had never made sushi together and decided Valentine's day would be a good occasion to try it. We went to China Town yesterday and got some of the ingredients and sauces. 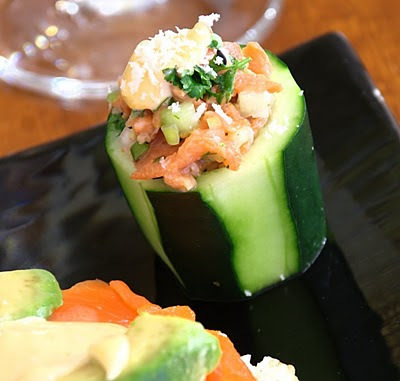 We prepared all our ingredients in advance and chopped up cucumber, beets, avocado, carrots, smoked salmon, cream cheese, radishes and mango. We made 5 rolls with different combinations of the ingredients we had prepared as well as a spicy mayonnaise. One of the rolls had the rice on the outside and the other rolls had the rice on the inside. 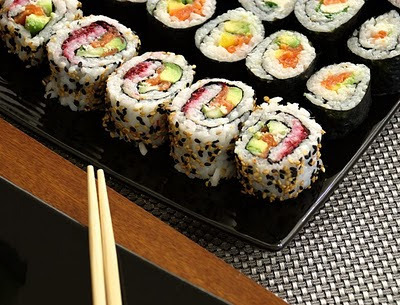 The rice was easy to make but we used a little too much of it in our rolls. We will know for next time. These were very easy to make and very healthy. In a food processor we made a mixture of cooked pork, parsley, ginger, cabbage, carrots and green onions. 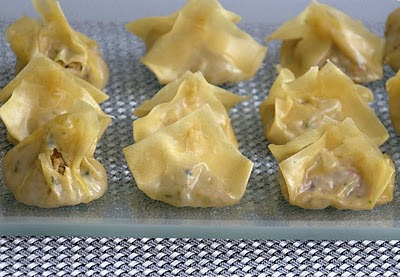 We scooped 1 teaspoon of the mixture per won ton wrapper and then steamed them in a bamboo steamer for 10 minutes. This mixture was very similar to the tartar but because it was chopped up in the food processor and then steamed, the taste was very different. Although it took about one and a half hours to prepare the entire meal, this was so much better than going out to a restaurant. We have a lot of leftover ingredients so they will most likely make an appearance on our blog throughout the week.